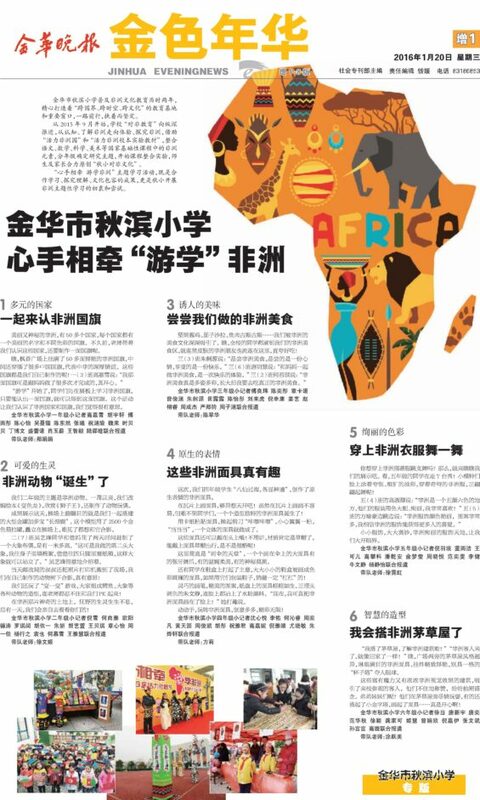 This series reviews coverage of Africa in Chinese newspapers, highlighting interesting reporting in China on a range of African topics, countries and regions. Over the period 18-28 January 2016 a few noteworthy cultural reflections on Africa were published in China. A Chinese artist spent two weeks in Africa and produced a series of landscape paintings, which are now on display in Shenzhen. Another exhibition in Hubei presents the photographs taken by 30 Chinese photographers in Africa over three years, and some of their adventures in Africa are recounted below. 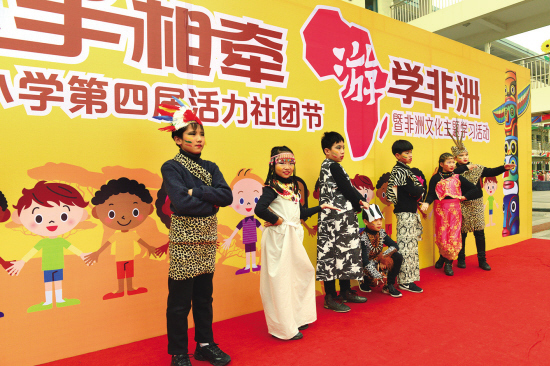 Finally, a primary school in Zhejiang implemented a special education programme on African culture, with face paint, thatched houses and tribal clothing included. 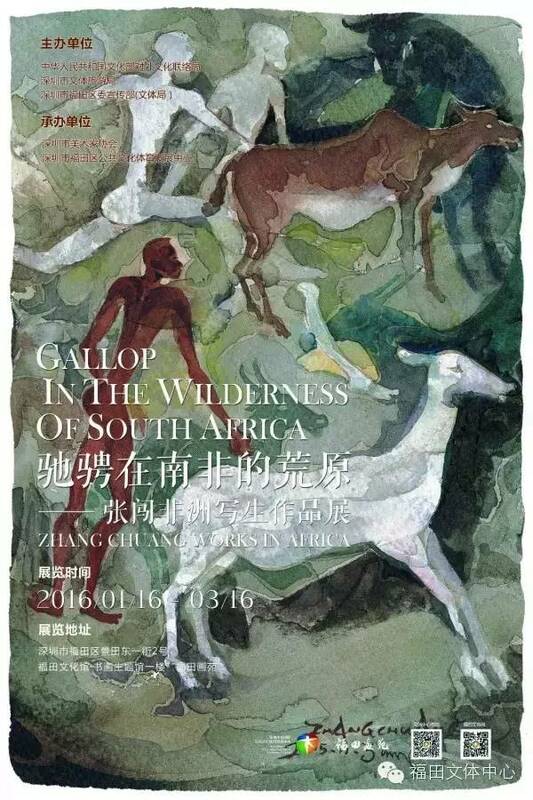 “Gallop in the Wilderness of South Africa” poster. On 18 January Daily Sunshine (晶报), a newspaper published in the southern city of Shenzhen linking Hong Kong to the Chinese mainland, published a short report inviting its readers to attend an art exhibition taking place in a museum in the city. The exhibition, which commenced on 16 January and is set to run for two months, features 56 paintings produced by the artist Zhang Chuang, a native of Shenzhen and vice-chairperson of the Shenzhen painters association. In October and November 2015 Zhang spent about two weeks in South Africa, Namibia and Mauritius as part of an artist exchange programme organized by the Chinese Ministry of Culture. The result is “Gallop in the Wilderness in South Africa”, an exhibition of 56 vivid artworks depicting African scenes and landscapes, some of which can be viewed in this online gallery. 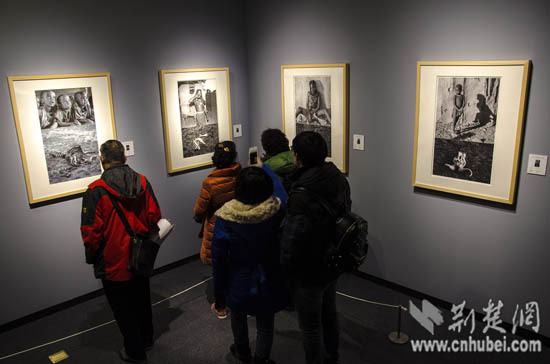 On 17 January a photo exhibition entitled “Deep Love in Africa” opened at the Hubei provincial museum in the city of Wuhan in Hubei province. The exhibition features 150 photos taken by more than 30 Chinese photographers over three years in Africa, aimed at capturing the natural environment, wild animals and local scenery. As local newspaper Chutian Gold (楚天金报) reported on 18 January, “The majestic lion, elephant and cheetah; the beautiful zebra and wildebeest; African tribes and the natural landscape – all are to be seen in the exhibition room”. 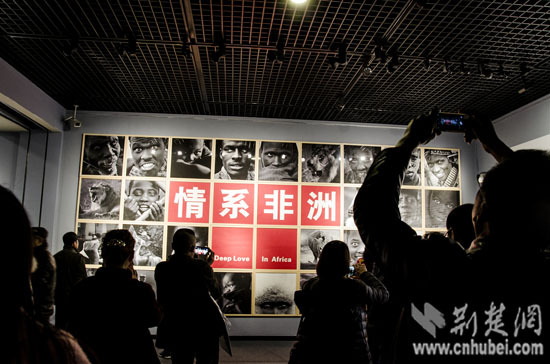 Deep Love in Africa photo exhibition in Wuhan, Hubei province. The activity emanated from an animal protection campaign broadcast on Chinese national broadcaster CCTV in 2010 under the slogan “When the Buying Stops, the Killing Can Too” (see WildAid). As a result, more than 30 Chinese photographers – including well-known professionals from Hubei province and a few hobbyists – turned their lenses on Africa, as Chutian Gold put it, “without regard for their personal safety and braving risks that ordinary people can hardly imagine to penetrate deep into Africa to observe and film the living conditions of wild animals”. Reportedly the Chinese photographers collectively travelled more than 200,000 kilometres over ten countries in order “to open a window on the continent for people to enter Africa, know Africa, understand Africa”. 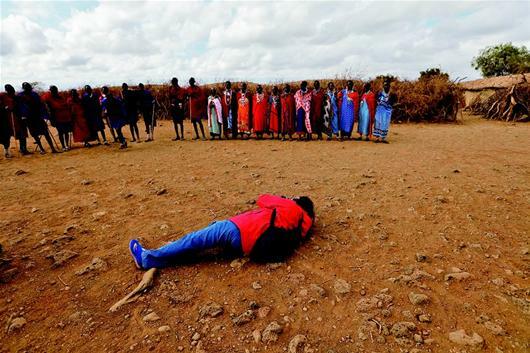 The newspaper recounts the determination of one of the amateur photographers, “Long-bearded Uncle” Dong Hongyou, to get just the right angle: “In the midst of a primitive African tribe”, Dong laid down flat on his stomach to take the picture on a surface full of cow dung (see image below published by Chutian Metropolis Daily). “Long-bearded Uncle” getting the right shot from a field covered in dung. Another local newspaper, Chutian Metropolis Daily (楚天都市报), published more detail on the photographers’ adventures in Africa. Peng Niansheng, the vice-chairperson of the Hubei photographers association who participated in tours to Africa for three years in a row, describes the magnificent sight of a multitude migrating wildebeest crossing the Mara River in Kenya. “In nature”, Peng marvelled, “there is massacre among animals, and there is self-sacrifice among animals, and so it will always be”. The newspaper reports that Peng spent time taking pictures among the Masai in East Africa and among the “red clay tribe” in “Namibia in West Africa” (sic), and was fascinated by the “rare mysteries” he encountered among these tribes, such as polygamy among the Masai and the red clay paint applied to the skins of the tribe in Namibia. Dong Hongyou, or Long-bearded Uncle, even overcame his fear of flying to join the team in taking to the air in a hired helicopter in Kenya. Dong and his colleagues opened the windows and leaned out as much as they dared; no-one spoke – all that could be heard were the constant whirr of camera shutters. We used light and shadows and screens to record images of African people and wild animals, a silent shout and rallying cry. This is the redemption not only of Africa; not only of the wild animals; not only of those majestic lions, elephants, leopards, the beautiful zebras, wildebeest and antelopes – but of the whole world and of ourselves. Our hearts are burning with love and esteem for all living things. 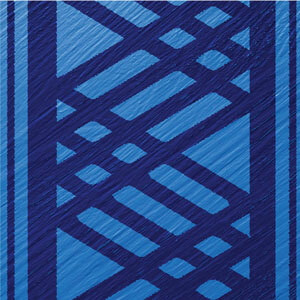 See this web post for more photos from the collection. On 20 January Jinhua Evening News (金华晚报), published in the city of Jinhua in the coastal province of Zhejiang, ran a full-page feature on a special education programme that took place at a local school, Qiubin Primary School. For the last two years this school has reportedly emphasized African elements in various subjects, but since September 2015 the school has implemented a special programme focusing on African culture with the aim of enabling pupils to “go from learning and comprehension to experience and investigate Africa for themselves” (hence the notion of “Study Abroad”). Helping Hands “Study Abroad” in Africa, as the exercise was called, saw each of the school’s six levels undertake a different project focused on African culture, and on 20 January Jinhua Evening News published the full story. The six items below are based on short reports produced by the teachers and pupils of Qiubin themselves, and hence reflect their own views on the African content they were studying. Jinhua Evening News, 20 January 2016. Level 1 was tasked with learning all the different flags of the countries of Africa, and then made the flags themselves and hung them up on the school yard, intermixed with various Chinese flags. Pupils had great fun making all the flags, because “beautiful and mysterious Africa” consists of more than 50 countries, and each has a “beautiful name and flags of various colours”. Level 4 drew all kinds of fantastic African masks on cardboard plates, letting their creativity run wild. Of various shapes and colours, some masks appeared menacing, others appeared sweet and gentle, and still others had a mysterious look. 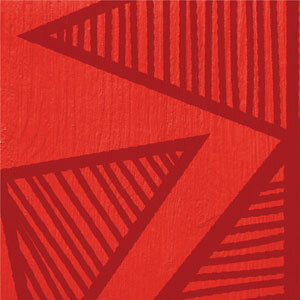 “With a deft brush and delicate patterns, the paper masks appeared vivid and lifelike”. Qiubin Primary School Level 5 pupils with African dress and face paint. 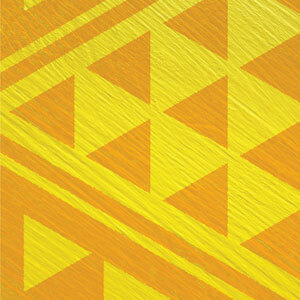 “Do you want to put on the clothing of an African tribe and dance? Then come see our display”. Level 5 had “little models who applied exaggerated, rough face paint, put on peculiar African clothes and then danced gracefully”. Level 6 constructed small models of what was perceived to be African architecture, although all we are told about the results of what appeared on the playground are “thatched houses” and a pyramid.